It’s 10 p.m. on a Thursday night. Outside the UW Women’s Center, all is quiet. But inside the building, high school girls crowd around a computer and cheer each other on as they do something memorable: submit their college applications. The application party is an annual tradition for Making Connections (MC), a Women’s Center program that helps low-income, first-generation, underrepresented girls graduate from high school on time and enroll in college. In recent years, 100 percent of the students who participated in the program—about 100 girls at any given time—have gone on to college, with 60 percent choosing the UW. The Women’s Center launched the Making Connections program after discovering that programs existed for stellar students and at-risk students, but not for students in the middle of the pack. “We don’t have a minimum GPA for participants,” says MC program manager Senait Habte, “but we are targeting that middle-level child.” Support for the program includes leadership gifts from Mikey Herring and Jim Phelps, Berthe and Stanley Habib, the Fordham Street Foundation, The Boeing Company, The Glaser Foundation, Safeco Insurance Company, and Wells Fargo & Company. The spirit of camaraderie that develops among the girls, and all the support from peers, staff, tutors, and mentors, has made the Making Connections program among the most successful of its type in the country. 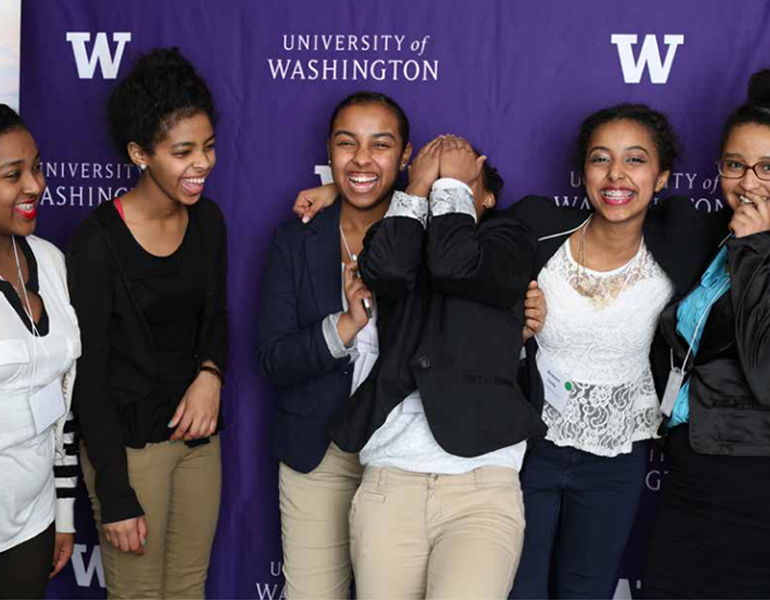 You can invest in the next generation of Washington's leaders by giving to the Making Connection program in the UW Women's Center. You can support research and teaching programs in the College of Arts & Sciences where we pursue challenging questions, conjure big ideas, and work tirelessly to improve lives and contribute to the global good.